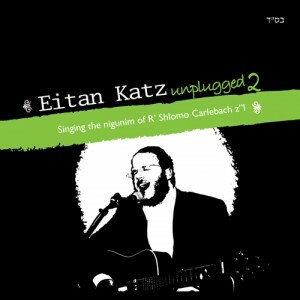 The first review I did for JMR was Eitan’s first Unplugged album. I absolutely loved it, and for good reason. However as much as I did love it this one might be even better. The album seems to be somewhere between Unplugged 1 and Baruch Hu, similarly all Carlebach compositions, but there was a maturation from Unplugged to Baruch Hu, and that has stuck around here. There is a relaxed, laid back feel to the album. It’s full of emotion, beautiful harmonies, and I love the instrumentals and his voice. I love that Eitan Katz has a unique style; you can always tell that a song is his. Many artists use a lot of heavy guitars, horns, awesome drum solos…etc. That’s not Eitan Katz at all (though it can be very good, don’t get me wrong). It’s all acoustic and soft, and even the fun danceable songs are, well, pretty. It’s not everyone’s style, but it’s his, and he does it well. There are also two duets on the album, which we didn’t have on the first Unplugged, and they are both wonderful. Another great thing about the album is that the songs are pretty long; only 2 of the 10 tracks are less than 5 minutes. That being said, none of the songs are very long (nothing reaches 6 minutes), which could easily get boring.The only thing I do not loveabout this album is that some of the songs are too slow for me. I have been not so patiently awaiting this album since I first heard about it, and I’m thrilled to have it! This is one of my favorite songs on the album. It starts out with a typical Eitan Katz beautiful relaxed feel, but a little faster than usual. But at about 4:00, the tempo picks up A LOT. As someone raised in the Deep South, I can say the music sounds like it’s from back home, but it also has an Eastern European feel. Anyway, I absolutely love the music here, and this song is amazing. A slower song with a lot of heart. It’s in general a very moving song, probably because when so much emotion is put into a song– the composition, the singing, everything, the listener has no choice but to feel it. Starting about a third of the way in, there are a lot of beautiful harmonies here. Like I’ve said before, I’m not a big fan of nigunim usually because I think Jewish lyrics are so beautiful, and we have no shortage of lyrics to pick from. That aside, I really like that this song in particular has a really interesting variety of instruments used in it and that it is especially upbeat. I LOVE this song. The first time I heard the album, it’s the one that stuck out to me. It has everything I love about Eitan Katz songs– somewhat atypical music, a lot of feeling, his really nice voice, full of harmonies, upbeat…I could go on and on. I love how a few times throughout the song the music stops and the vocals are alone. It’s also got a faster tempo than the average Eitan Katz song yet is still very relaxing. Another one of my favorite songs on the album. This is one of the slower songs on the album, which most of you know by now, I generally don’t prefer. That being said, with slower songs, I feel like Eitan Katz is able to put more feeling into the songs and show his vocal skills a little more. Pe’ero is a great example of this and is beautiful. Here’s where I contradict myself. Eitan Katz has an amazing voice by himself, but I LOVE to hear him harmonize with other singers, like he does in this song with Elli Kranzler. I know its a slower song, but it’s gorgeous. The harmonies are fantastic, and though I don’t normally like to give times to go to since you don’t all have the CD… the harmonies at 4:22 without music are pretty breathtaking. See for yourself. There are a lot of opportunities to hear Eitan and Shlomo Katz (brothers) sing together, but we can always use more because it’s great. Just the concept of brothers singing together is a beautiful thing, but they happen to sound really good together. This is also a faster song– good for driving and singing along. Another one of my favorites on the album (ok , I realize I have a lot of favorites, but I love this album). More great harmonies! Another really slow song. Pretty and moving, but not my favorite. What a fun tune! I know Eitan Katz didn’t compose it, but he played it here and sang it, and he did a really good job! This one will make you want to clap your hands along with it, and just as a warning, is not good to listen to on your iPod at work, especially if you have a tendency to sing along. Great song, and the most fun on the album, which makes sense since it’s Od Yishoma. This is the softest and slowest song on the entire album if I’m not mistaken. Got to love the lyrics (and they don’t get old for me even though everyone uses them), and of course got to love the harmonies and the emotion that goes into every note, as is typical of Eitan Katz. As a pretty big Eitan Katz fan, I was holding this album to a really high standard. I expected everysong to be one that I liked (of course, some more than others), and I expected it all to be beautiful. I wasn’t disappointed!